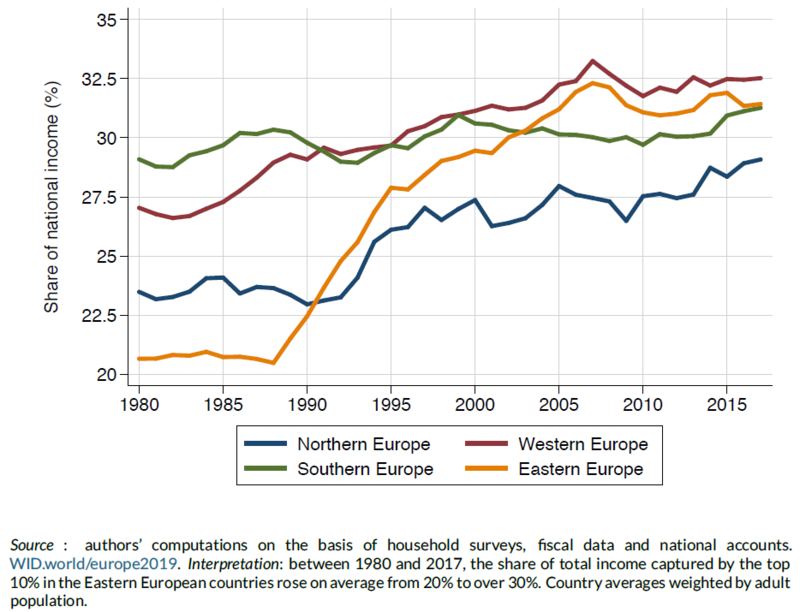 In this new paper and in the accompanying issue brief (available in English, German, French and Spanish), Thomas Blanchet, Lucas Chancel and Amory Gethin estimate the evolution of income inequality in 38 European countries from 1980 to 2017 by combining surveys, tax data and national accounts. They develop a harmonized methodology, using machine learning, non-linear survey calibration and extreme value theory, in order to produce homogeneous pre-tax and post-tax income inequality estimates, comparable across countries and consistent with official national income growth rates. Inequalities have increased in a majority of European countries, both at the top and at the bottom of the distribution, especially between 1980 and 2000. The European top 1% grew more than two times faster than the bottom 50% and captured 17% of regional income growth. Relative poverty in Europe went through ups and downs, increasing from 20% in 1980 to 22% in 2017. Inequalities yet remain lower and have increased much less in Europe than in the US, despite the persistence of strong income differences between European countries and the weaker progressivity of European-wide income redistribution.